150:1.1 Of all the daring things which Jesus did in connection with his earth career, the most amazing was his sudden announcement on the evening of January 16: “On the morrow we will set apart ten women for the ministering work of the kingdom.” At the beginning of the two weeks’ period during which the apostles and the evangelists were to be absent from Bethsaida on their furlough, Jesus requested David to summon his parents back to their home and to dispatch messengers calling to Bethsaida ten devout women who had served in the administration of the former encampment and the tented infirmary. These women had all listened to the instruction given the young evangelists, but it had never occurred to either themselves or their teachers that Jesus would dare to commission women to teach the gospel of the kingdom and minister to the sick. These ten women selected and commissioned by Jesus were: Susanna, the daughter of the former chazan of the Nazareth synagogue; Joanna, the wife of Chuza, the steward of Herod Antipas; Elizabeth, the daughter of a wealthy Jew of Tiberias and Sepphoris; Martha, the elder sister of Andrew and Peter; Rachel, the sister-in-law of Jude, the Master’s brother in the flesh; Nasanta, the daughter of Elman, the Syrian physician; Milcha, a cousin of the Apostle Thomas; Ruth, the eldest daughter of Matthew Levi; Celta, the daughter of a Roman centurion; and Agaman, a widow of Damascus. 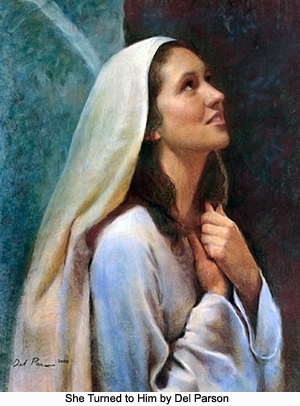 Subsequently, Jesus added two other women to this group— Mary Magdalene and Rebecca, the daughter of Joseph of Arimathea. 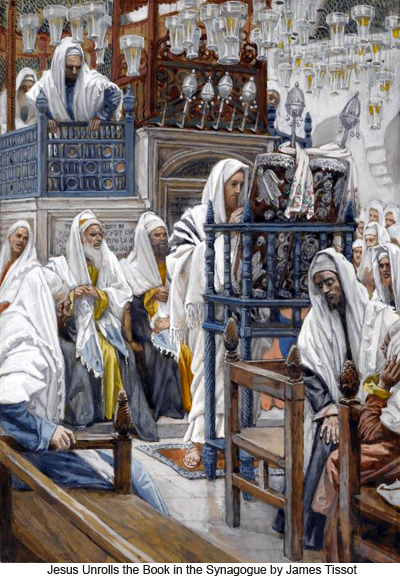 150:1.3 It was most astounding in that day, when women were not even allowed on the main floor of the synagogue (being confined to the women’s gallery), to behold them being recognized as authorized teachers of the new gospel of the kingdom. The charge which Jesus gave these ten women as he set them apart for gospel teaching and ministry was the emancipation proclamation which set free all women and for all time; no more was man to look upon woman as his spiritual inferior. This was a decided shock to even the twelve apostles. 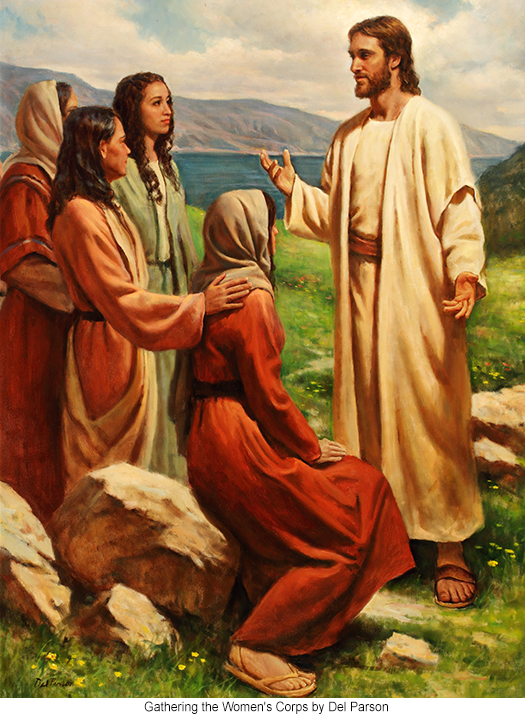 Notwithstanding they had many times heard the Master say that “in the kingdom of heaven there is neither rich nor poor, free nor bond, male nor female, all are equally the sons and daughters of God,” they were literally stunned when he proposed formally to commission these ten women as religious teachers and even to permit their traveling about with them. The whole country was stirred up by this proceeding, the enemies of Jesus making great capital out of this move, but everywhere the women believers in the good news stood stanchly behind their chosen sisters and voiced no uncertain approval of this tardy acknowledgment of woman’s place in religious work. And this liberation of women, giving them due recognition, was practiced by the apostles immediately after the Master’s departure, albeit they fell back to the olden customs in subsequent generations. Throughout the early days of the Christian church women teachers and ministers were called deaconesses and were accorded general recognition. But Paul, despite the fact that he conceded all this in theory, never really incorporated it into his own attitude and personally found it difficult to carry out in practice. 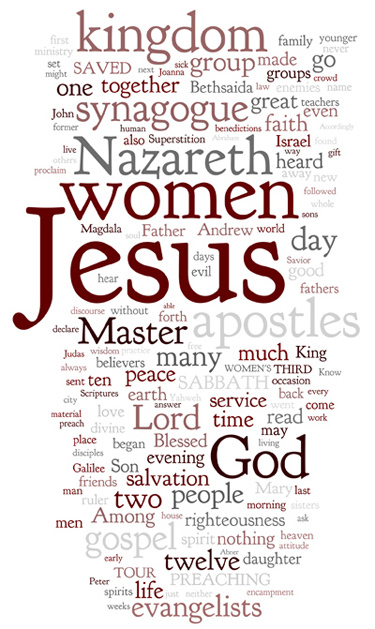 150:2.3 Mary Magdalene became the most effective teacher of the gospel among this group of twelve women evangelists. She was set apart for such service, together with Rebecca, at Jotapata about four weeks subsequent to her conversion. Mary and Rebecca, with the others of this group, went on through the remainder of Jesus’ life on earth, laboring faithfully and effectively for the enlightenment and uplifting of their downtrodden sisters; and when the last and tragic episode in the drama of Jesus’ life was being enacted, notwithstanding the apostles all fled but one, these women were all present, and not one either denied or betrayed him. 150:3.1 The Sabbath services of the apostolic party had been put in the hands of the women by Andrew, upon instructions from Jesus. This meant, of course, that they could not be held in the new synagogue. The women selected Joanna to have charge of this occasion, and the meeting was held in the banquet room of Herod’s new palace, Herod being away in residence at Julias in Perea. Joanna read from the Scripture concerning woman’s work in the religious life of Israel, making reference to Miriam, Deborah, Esther, and others. 150:4.1 The next evening, having gathered together the twelve apostles, the apostles of John, and the newly commissioned women’s group, Jesus said: “You see for yourselves that the harvest is plenteous, but the laborers are few. Let us all, therefore, pray the Lord of the harvest that he send forth still more laborers into his fields. 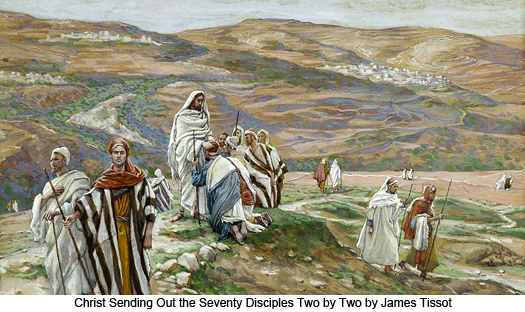 While I remain to comfort and instruct the younger teachers, I would send out the older ones two and two that they may pass quickly over all Galilee preaching the gospel of the kingdom while it is yet convenient and peaceful.” Then he designated the pairs of apostles as he desired them to go forth, and they were: Andrew and Peter, James and John Zebedee, Philip and Nathaniel, Thomas and Matthew, James and Judas Alpheus, Simon Zelotes and Judas Iscariot. 150:5.2 “When men and women ask what shall we do to be saved, you shall answer, Believe this gospel of the kingdom; accept divine forgiveness. By faith recognize the indwelling spirit of God, whose acceptance makes you a son of God. Have you not read in the Scriptures where it says, `In the Lord have I righteousness and strength.’ Also where the Father says, `My righteousness is near; my salvation has gone forth, and my arms shall enfold my people.’ `My soul shall be joyful in the love of my God, for he has clothed me with the garments of salvation and has covered me with the robe of his righteousness.’ Have you not also read of the Father that his name `shall be called the Lord our righteousness.’ `Take away the filthy rags of self-righteousness and clothe my son with the robe of divine righteousness and eternal salvation.’ It is forever true, `the just shall live by faith.’ Entrance into the Father’s kingdom is wholly free, but progress—growth in grace—is essential to continuance therein. 150:6.1 At the evening discussions Jesus talked upon many subjects. During the remainder of this tour—before they all reunited at Nazareth—he discussed “The Love of God,” “Dreams and Visions,” “Malice,” “Humility and Meekness,” “Courage and Loyalty,” “Music and Worship,” “Service and Obedience,” “Pride and Presumption,” “Forgiveness in Relation to Repentance,” “Peace and Perfection,” “Evil Speaking and Envy,” “Evil, Sin, and Temptation,” “Doubts and Unbelief,” “Wisdom and Worship.” With the older apostles away, these younger groups of both men and women more freely entered into these discussions with the Master. 150:6.2 After spending two or three days with one group of twelve evangelists, Jesus would move on to join another group, being informed as to the whereabouts and movements of all these workers by David’s messengers. This being their first tour, the women remained much of the time with Jesus. Through the messenger service each of these groups was kept fully informed concerning the progress of the tour, and the receipt of news from other groups was always a source of encouragement to these scattered and separated workers. 150:6.3 Before their separation it had been arranged that the twelve apostles, together with the evangelists and the women’s corps, should assemble at Nazareth to meet the Master on Friday, March 4. Accordingly, about this time, from all parts of central and southern Galilee these various groups of apostles and evangelists began moving toward Nazareth. By midafternoon, Andrew and Peter, the last to arrive, had reached the encampment prepared by the early arrivals and situated on the highlands to the north of the city. And this was the first time Jesus had visited Nazareth since the beginning of his public ministry. 150:7.2 The people of Nazareth were never reputed for piety and righteous living. As the years passed, this village became increasingly contaminated by the low moral standards of near-by Sepphoris. Throughout Jesus’ youth and young manhood there had been a division of opinion in Nazareth regarding him; there was much resentment when he moved to Capernaum. 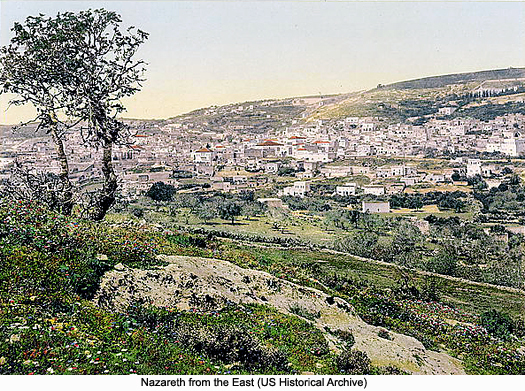 While the inhabitants of Nazareth had heard much about the doings of their former carpenter, they were offended that he had never included his native village in any of his earlier preaching tours. They had indeed heard of Jesus’ fame, but the majority of the citizens were angry because he had done none of his great works in the city of his youth. 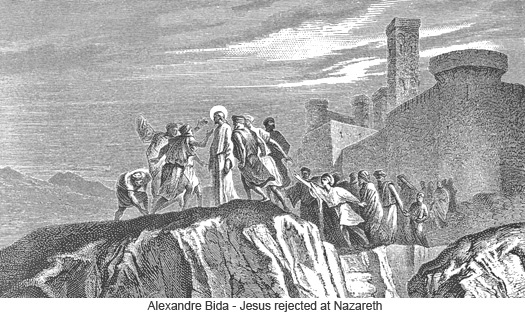 For months the people of Nazareth had discussed Jesus much, but their opinions were, on the whole, unfavorable to him. 150:7.4 Most of the older of Jesus’ friends, including the doting chazan teacher of his youth, were dead or had left Nazareth, and the younger generation was prone to resent his fame with strong jealousy. 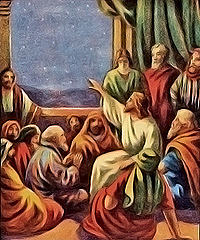 They failed to remember his early devotion to his father’s family, and they were bitter in their criticism of his neglect to visit his brother and his married sisters living in Nazareth. The attitude of Jesus’ family toward him had also tended to increase this unkind feeling of the citizenry. The orthodox among the Jews even presumed to criticize Jesus because he walked too fast on the way to the synagogue this Sabbath morning. 150:8.7 Then followed the last benediction: “O bestow on your people Israel great peace forever, for you are King and the Lord of all peace. And it is good in your eyes to bless Israel at all times and at every hour with peace. Blessed are you, Yahweh, who blesses his people Israel with peace.” The congregation looked not at the ruler as he recited the benedictions. Following the benedictions he offered an informal prayer suitable for the occasion, and when this was concluded, all the congregation joined in saying amen. 150:8.10 Jesus closed the book and, after handing it back to the ruler of the synagogue, sat down and began to discourse to the people. 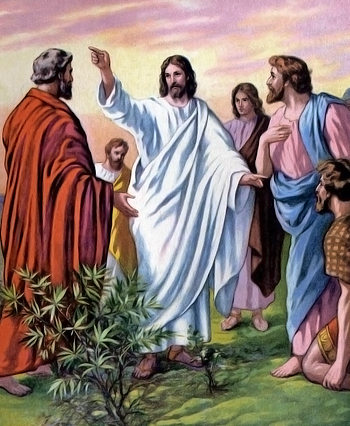 He began by saying: “Today are these Scriptures fulfilled.” And then Jesus spoke for almost fifteen minutes on “The Sons and Daughters of God.” Many of the people were pleased with the discourse, and they marveled at his graciousness and wisdom. 150:9.3 Jesus would have good-naturedly managed the crowd and effectively disarmed even his violent enemies had it not been for the tactical blunder of one of his own apostles, Simon Zelotes, who, with the help of Nahor, one of the younger evangelists, had meanwhile gathered together a group of Jesus’ friends from among the crowd and, assuming a belligerent attitude, had served notice on the enemies of the Master to go hence. Jesus had long taught the apostles that a soft answer turns away wrath, but his followers were not accustomed to seeing their beloved teacher, whom they so willingly called Master, treated with such discourtesy and disdain. It was too much for them, and they found themselves giving expression to passionate and vehement resentment, all of which only tended to arouse the mob spirit in this ungodly and uncouth assembly. And so, under the leadership of hirelings, these ruffians laid hold upon Jesus and rushed him out of the synagogue to the brow of a near-by precipitous hill, where they were minded to shove him over the edge to his death below. But just as they were about to push him over the edge of the cliff, Jesus turned suddenly upon his captors and, facing them, quietly folded his arms. He said nothing, but his friends were more than astonished when, as he started to walk forward, the mob parted and permitted him to pass on unmolested. 150:9.4 Jesus, followed by his disciples, proceeded to their encampment, where all this was recounted. And they made ready that evening to go back to Capernaum early the next day, as Jesus had directed. This turbulent ending of the third public preaching tour had a sobering effect upon all of Jesus’ followers. They were beginning to realize the meaning of some of the Master’s teachings; they were awaking to the fact that the kingdom would come only through much sorrow and bitter disappointment.